Although they are the co-authors, the narrative is presented in the first person because they want to establish a direct, personal, almost conversational rapport with their reader. The first half of the book describes what deliberate practice is, why it works as well as it doers, and how various experts in diverse fields apply it to develop — yes, over time — their extraordinary abilities. Next, in a brief interlude, they examine more closely the issue of innate endowment and what role it might play in limiting how far smoke people can go in attaining expert performance. 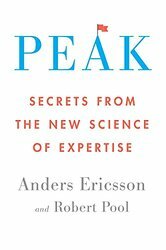 With regard to the concept deliberate practice, that is so widely and so durably misunderstood, there is no doubt that less than 10,000 hours of deliberate practice (preferably under expert supervision) can help almost anyone strengthen certain skills that peak performance in a given field may require. That is not to suggest, however, that – with very rare exception –anyone can shoot a basketball as well as Michael Jordan, Ray Allen, or Stephen Curry; that anyone can play golf as well as Bob Jones, Jack Nicklaus, and Tiger Woods; or that anyone can develop skills playing chess that are comparable with those of Alexander Alekhine, Bobby Fischer, or Boris Spassky. (Let’s save IBM’s Big Blue for discussion on another occasion.) That said, it is indisputable that deliberate practice can only help someone to become their best at doing [whatever] that would otherwise not be possible. This is probably what Alvin Toffler had in mind when suggesting, “The illiterate of the 21st century will not be those who cannot read and write, but those who cannot learn, unlearn, and relearn.” Those who refuse to learn, unlearn, and relearn will compound their illiteracy with deliberate practice.